How many of you have gained all of your knowledge about the big holiday Hoo-ha today from the movie? 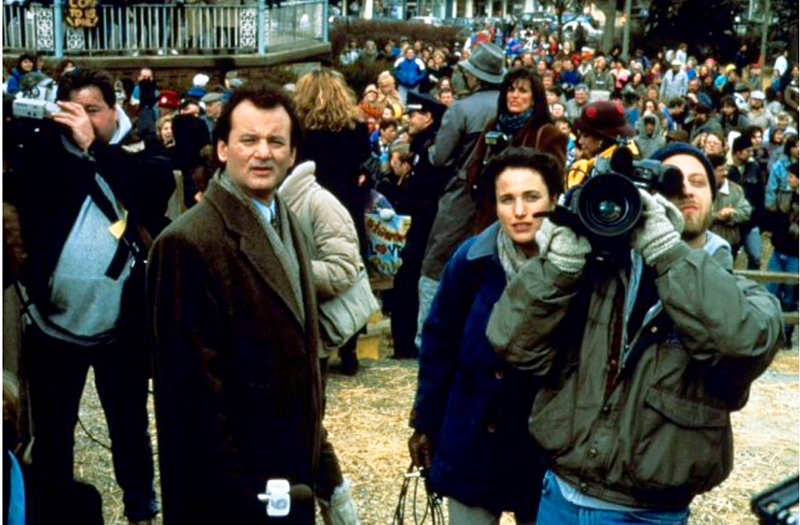 You know, Groundhog Day, the Lay’s Potato Chip of a flick starring Bill Murray and Andie MacDowell from 1993 that you couldn’t help but watch over and over again? Of course sometimes Hollywood (loosely) bases its best work on fact, and the late, great Harold Ramis was no different as he co-wrote and directed this comedy that became legend. And so on this Feb. 2 here on The Blog of Funny Names I offer you the hard truth about Groundhog Day. Thank you very much, WikiPedia and history.com for your thoroughness about this day in American history. It all started in 1887 at a place called Gobbler’s Knob in Punxatawney, Pa. That’s where local newspaper editor Clymer H. Freas, a member of the Punxatawney Groundhog Club, decided that the furry groundhog they all called Phil was America’s true weather-predicting furry. And if that’s not enough to earn a spot in the BoFN, I’m crawling back into bed for the rest of winter. The legend we all repeat again and again says that if Phil sees his shadow, he’ll scurry back into his hole, and we’ll face six more weeks of winter. But if it’s cloudy, out he’ll come to cavort, and we’ll be in for an early spring. It’s all based on science instead of shadowy smoke and mirrors, of course. Groundhogs — or hedgehogs, if you prefer — hibernate for the winter months, and come out for spring. In any case, Happy Groundhog Day. I’m rooting for a cloudy day over there in Gobbler’s Knob and an early spring over here in Syracuse, N.Y. This entry was posted in Funny names in holidays, funny names in movies and tagged Groundhog Day, Punxsutawney Phil. Bookmark the permalink. Speaking of funny names, somebody with my funny name is having a birthday today. I just had to share that funny fact, Mark. Happy Birthday, Ann Koplow, seriously! Happy birthday indeed, Ann Koplow! Since I live in Pennsylvania, far from Punxatawney at the eastern end of the state I often see Phil in our Lottery commercials, but I’ve never met the celebrity! From the History Channel Link: “Groundhog Day has its roots in the ancient Christian tradition of Candlemas Day, when clergy would bless and distribute candles needed for winter. The candles represented how long and cold the winter would be. Germans expanded on this concept by selecting an animal–the hedgehog–as a means of predicting weather. Once they came to America, German settlers in Pennsylvania continued the tradition, although they switched from hedgehogs to groundhogs, which were plentiful in the Keystone State. Groundhogs, also called woodchucks and whose scientific name is Marmota monax, typically weigh 12 to 15 pounds and live six to eight years. They eat vegetables and fruits, whistle when they’re frightened or looking for a mate and can climb trees and swim. They go into hibernation in the late fall; during this time, their body temperatures drop significantly, their heartbeats slow from 80 to five beats per minute and they can lose 30 percent of their body fat. In February, male groundhogs emerge from their burrows to look for a mate (not to predict the weather) before going underground again. They come out of hibernation for good in March. 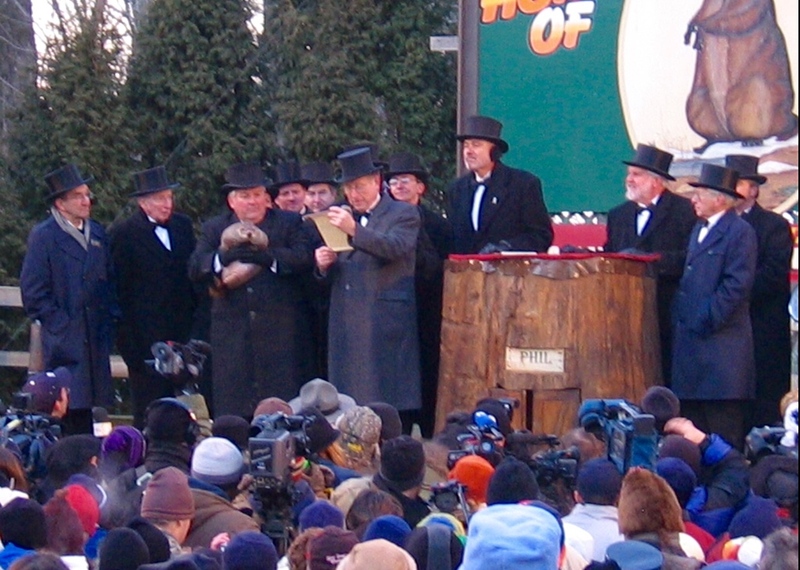 NOTE: The article doesn’t state the origins of the Punxsutawney Groundhog Club. Obviously Punxsutawney is an Indian word. I didn’t know the German settlers started it all! Our own Dunkirk Dave had the exact opposite prediction than Punxsutawney Phil. I don’t know who to believe. BTW, I loved the movie – I couldn’t help thinking about it on my way to work this morning – you know, the same old, same old, rinse, repeat. Yes, I love the movie as well, CM. And I am ready for spring. I’ll leave Gobbler’s Knob alone. But Climber Freeze (at least that’s how I say it) is a great name. Surely there are pics of a Punk-satawney Phil on the interwebs, with a mohawk? I never understood the logic of Groundhog Day; it seems that if he SAW his shadow, then the sun would be out, lending itself to sunnier weather. But it’s the opposite. Hmph. Hmphhh indeed about a groundhog predicting the coming of spring with a shadow, right, Kerbey. But as long as today’s result was for an early arrival of the season, I’m all for it. Ha! How can you leave Gobbler’s Knob alone?!? That is a funtastic name! It even rhymes. Whoever came up with that name would have loved this blog, even if they didn’t know what a blog was. They’d surely comment on it any way they could now, King Dave, catching all the Funny Names they could! Gobbler’s Knob is one of those phrases that begs to be only pronounced with a British accent. It just doesn’t sound right otherwise. Excellent names all around this tradition. These folks knew what they were doing. Now I know about Phil from two sources – the movie and this blog! The whole scene there is of German descent, Arto. Try the names that way? It’s a tough accent to master on the phrase Gobber’s Knob, that’s for sure, King Dave. i want to live on gobbler’s knob. I think it’s a mystical piece of Earth, Beth. It all seems so counterintuitive to me. He sees his shadow which means it’s sunny, and that means 6 more weeks of winter. If he doesn’t see his shadow because it’s obscured by stuff, then supposedly spring is here? Think of it this way, King Dave: No shadow to scare him back into hibernation, he’s outside into spring.